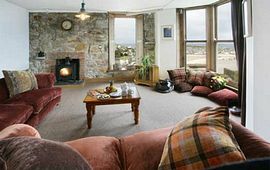 finest views to be found and gazes out across the ancient harbour town of St Ives to the ocean beyond. Following recent extensive yet sympathetic renovations, three luxurious holiday apartments were born without detriment to the fine architectural heritage of this house. 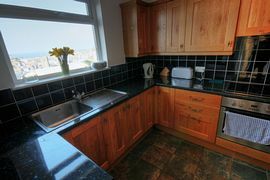 and period features, large windows frame stunning land and seascapes. Luxury fittings abound with hi-tech kitchens, modern bathrooms including a wet room, high-spec audio-visual and communication systems. All of the apartments are furnished comfortably and thoughtfully. The owners it would appear, has thought of everything for their guests, right down to the little items that you never seem to find but always need. The penthouse flat has a private balcony that affords some of the most fabulous views to be found in St Ives and the sunsets across the bay are simply to die for. 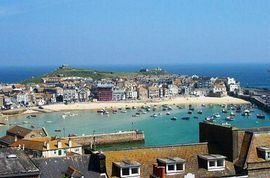 These apartments are a rarity: fabulous location, luxury accommodations with stunning views, and on-site parking spaces that are like gold dust in St Ives. Just priceless. 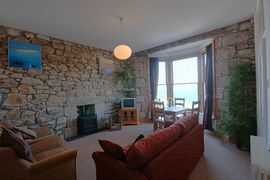 Fantastic Sea Views From All Rooms. The main A30 runs from Exeter to Penzance. At Lelant just west of Hayle take the A3074 to St. Ives. Immediately after Carbis Bay watch for the Tregenna Castle signs on the left hand side. Just past the entrance to the Tregenna Castle Hotel on the left there is a fork in the road, take the left hand fork (signposted to the Leisure centre). After approx 300 metres there is a sharp bend to the left which is steeply inclined. Go around this bend and take the second right signposted SeaView Terrace and go to the end of the road and Pednolver Apartments car park is on your right, behind the yellow security posts. Please note, Pednolver Terrace does not appear on maps, if using sat/nav look for SeaView Terrace. By Train: Regular Intercity Services running to Penzance stop at St. Erth station, and from there a frequent (approx every half hour) local service runs along the three mile scenic branch line to St. Ives. At St Ives station head towards St. Ives, take the first set of steep steps on your left going up to The Terrace. You will see a no entry road opposite, short walk to top of road; Pednolver Terrace is in front of you.Turn right and walk to the end of the pavement go through the iron gates and Pednolver Apartments are at the end of the path. By Bus: from terminal turn left up the hill, with sea to your left, walk along The Terrace until you see a no entry road on the right. Short walk to top of road, Pednolver Terrace is in front of you. Turn right and walk to the end of the pavement go through the iron gates and Pednolver Apartments are at the end of the path.By Air: Regular Flights from Gatwick and Stanstead to Newquay Airport operate with only 40 minutes flying time. Taxi to the St Ives £40 approx.